Last summer's reading included an Atlantic article, "Why Kids Want Things", by Joel Pinsker—well worth your time. So, how do we navigate that? Well, our appearance is one of the things we navigate with. So, what does a kid see when they see another kid? They see the expression on their face, they see the body language, the posture, and the clothes they’re wearing. And so a kid who’s not very self-confident in navigating this is going to maybe feel a little more self-confident if they’re wearing the right kind of clothes rather than the wrong kind of clothes. Here we’re learning, right off the bat, that having things can help us define who we are." I was reminded of an incident from our sons's middle school years. I found several cotton-piqué Ralph Laurent Polo shirts at Value Village. (Many of the kids' shirts came from what we called V- Squared; we lived a few blocks away and there was always an ample stock of boys' tees.) 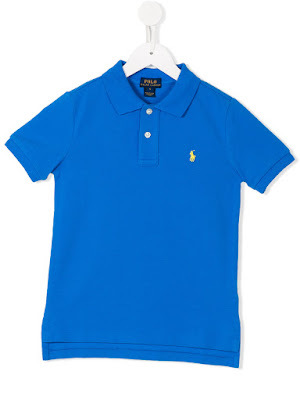 When Jules appeared in the schoolyard in his Polo shirt, a boy pointed to the logo and said, "See that little horse? You don't want any shirt that doesn't have that." He came home to inform me; I was disconcerted by his conviction. I told him the little horse was not de rigeur. The same son was over for dinner recently and expressed jubilation about a recent V-Squared haul: a capsule wardrobe of couple of pairs of new-condition pants, Woolrich shirt-jacket, and Ralph Lauren sweater. Total cost about $30. I thought, maybe the awareness of brands is not unremittingly bad, if we can also instil the wisdom of thrifting, and the skill of assessing quality. "Parents who act in ways that value things, parents who make a lot of sacrifices to get a lot of things, parents who get a lot of joy from buying things, parents who talk a lot about things—they tend to have adult children who act the same way. Now, part of this is probably some bias as people recall their childhoods, but I don’t think that’s all of it. The helpful thing for parents here—and also the harmful—is yes, peers are really important, but our kids are watching us." I have written about the legacy of having a Depression-era mother. At times, her thrift seemed withholding and joyless; I rebelled at sixteen by buying a full-price Etienne Aigner wallet with my first paycheque from J.C. Penney. But within a few years, I was sewing, thrifting, trading with girlfriends. To this day when I pay full retail, I hear her her critical voice. I now appreciate more than resent what she was up to, and am amused to see her influence handed down from her to me, and now to her grandson. Grade 7 is also puberty, which is a physical crisis as well as a social one. It is interesting that "materialism", like "consumerism" has very different and even contradictory definitions. (I'm referring to the excellent online OED). Good to see that the twins emerged relatively unscathed from those siren songs and group pressures. I have friends who arrived as refugees here. They were professionals in their home country, and while they weren't living in dire poverty, the jobs they held here were far more humble and less well-paid. They had three daughters, and fortunately the latter managed not to feel inferior to classmates who had branded clothing and other desirable markers; they developed their own style and concentrated on their studies and cultural activities. lagattta: My extended family sponsored two refugees from an African country, young teenaged males. One took trades training, worked, married and had two children. The other saw the "goodies" and wanted them quickly, got into a gang and sold drugs. Murdered summer before last. From what I can see, brand awareness is much much more intense than when I was growing up. Back then my Mom made a lot of our clothes to stretch the family budget and that was fine. No one cared about having a particular logo on your clothes or bags. Of course she went too far and made matching outfits for us three girls...and herself!! That, I disliked. Like you, my parents grew up in the Depression. My heritage shows up in my need to have my shoes repaired instead of throwing them out. Those non-repairable soles really bug me. LauraH: Thrifting is easy but you need patience. It is perfect for kids' tees etc as there are endless events like fun runs who dump new tees when the event is over. Most of the time I come home empty handed but it's my idea of fun. It's amazing what people give away. Just last week I found a charcoal grey pinstriped YSL blazer in excellent condition but did not take as no need for it. Let someone else be astonished to find it! Brand awareness has been around a long time. My sister was a PITA about Capezio shoes when she was about 15 or 16 (1962-63), and I remember similar "must haves" among my cohort. But it IS overwhelming now, thanks to the intrusion of celebrity culture. Yes, celebrity culture but also hip hop, which touts brands, whether for shoes or cars, and glorifies luxury brands. "Gucci" is now used as an adjective. Not to mention "flog blogs". I wore Capezios in 8th grade, 1955. I now have painful feet and have had several surgeries. Don't know if there's a connection. I know that branding has been around for many decades but it just seems so all pervasive now. Just yesterday I was looking for an outfit for a new great nephew - spotted something colourful only to find a designer logo scrawled across the front - even as a newborn he is expected to be an advertisement for this company after I've paid for the privilege! Insane! I was most influenced by my dad who always peached quality over quantity - when he could finally afford it he had his suits custom made and always bought the best quality shoes possible. But I think I'm the only one of my siblings who followed this credo - the rest would rather have "designer" logos plastered all over their clothes. And if I can get a bargain, so much the better. I intend checking out the large Value Village not too far from my apt. for some accessories and a new consignment store has opened not far from my library so I'm going to see what they might have on hand as well. I'll never forget my first pair of Capezios, supplied by my very fashionable and doting grandmother. They were black leather mary janes with three leather balloons on the top of the toes. The balloons had long "strings" that twisted and were red, olive green and blue. They are still the prettiest shoes I've ever owned. I was 7 years old. Lucky you having a son who is aware of a good deal! Nothing beats a great thrift find. Roberta: Maybe it is genetic, and the trait may have served some evolutionary purpose, so that we "gather nuts for a hard winter." Carol: The person to ask is your surgeon. I hope your feet are OK now. Margie: If you find anything, let us know! I still carry an Italian straw handbag I found at V-Squared a decade ago. (Only light use, in summer.) My Dad was that way too. Bunny: What a loving gift, and at 7 you must have been adorable in them! I have a certain satisfaction in a thrifted find, very unlike just buying in a store. First there's the bargain, and then there's rescuing it from a landfill. Many thanks to everyone who donates! I especially love seeing young adults who are there shopping and trying on— and looking fantastic.